RALEIGH, N.C. (January 15, 2013) – The AKC Canine Health Foundation (CHF) announces today a major effort underway to tackle the devastating condition commonly known as bloat. The Bloat Initiative will address the need for both education and research. 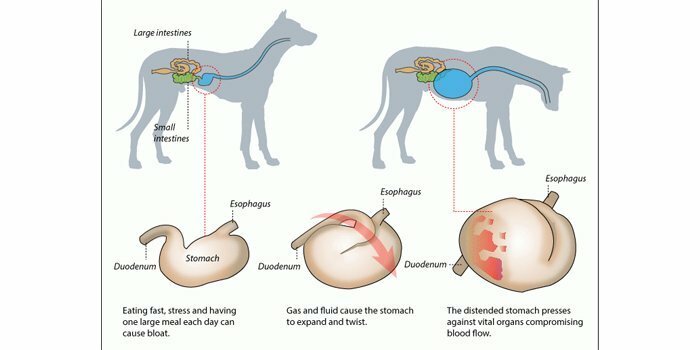 Gastric dilatation –volvulus, or bloat — is a devastating condition that can develop in any dog, although it is particularly common in large-breed and deep-chested dogs. Bloat develops when the stomach fills with air and then twists on itself, preventing air and liquid from leaving the stomach. Over time, the stomach gets larger and larger. This cuts off circulation and prevents blood from getting back to the heart from the rest of the abdomen and the rear legs. The stomach wall itself can also be severely damaged from loss of blood flow as can the spleen. Bloat requires immediate stabilization and prompt surgical correction, and may still be fatal in some severely affected dogs. To help educate dog owners about bloat, CHF will launch a free webinar in mid-2013 describing possible causes of bloat, susceptible breeds, symptoms, medical intervention, and explanation of research needed. “Because bloat progresses so rapidly, part of our focus is on educating the public on the signs and symptoms to look for if they suspect their dog may have bloat,” said Nordone. The Foundation will also provide continuing education for veterinarians showing surgical procedures used for prevention during spay and neuter. CHF is extremely grateful for the dog clubs that, as the inaugural sponsors of the Bloat Initiative, are making these education and research efforts possible. For more information about bloat, to donate to the effort, and to view a complete list of sponsors, visit www.akcchf.org/bloat. Like CHF at www.facebook.com/akccaninehealthfoundation or follow CHF on Twitter at @CanineHealthFnd. The AKC Canine Health Foundation (CHF) is a non-profit organization dedicated to helping dogs live longer, healthier lives by funding research that helps prevent, treat and cure canine disease. Established in 1995, CHF’s mission is to advance the health of all dogs and their owners by funding sound scientific research and supporting the dissemination of canine health information. Through the generous support of the American Kennel Club, Nestlé Purina PetCare, Pfizer Animal Health, dog clubs and dog owners worldwide, CHF has dedicated more than $34 million to canine health research projects and education programs. Visit CHF online at www.akcchf.org for more information.